Thanks to Stephen Bullon for drawing my attention to the BBC TV programme University Challenge, which this week had a question requiring the identification of Shakespearean plays from IPA transcriptions of quotations from them. (If you are in the UK you can still, for the next day or two, access this episode on the iPlayer. From about 8:00 in.) It started off well enough, except perhaps that Jeremy Paxman, the questionmaster, characterized this starter question test as “rendered into phonetic English”. (As opposed, we might ask, to what other kind of English? Better, “transcribed into phonetic symbols”.) A member of the Balliol team correctly recognized “Beware the Ides of March” as coming from Julius Caesar. But the follow-up “picture questions” were rather shocking. What do you make of this? OK, it’s “I know a bank where the wild thyme blows…”. But what kind of accent is this? Is it some kind of American or Irish English, with ɑ rather than ɒ for the LOT vowel in oxlips and nodding? Well, no, because it’s non-rhotic. Why is it so oddly transcribed? Why is the TRAP vowel rendered as æ in bank and and but as a in over-canopied? You can make a case for writing the PRICE diphthong as aj, but not for writing it indifferently as aj, ai and ɑj in just four lines. It gets worse. OK, here line 1 is still non-rhotic, but then we go rhotic. No problem. But what on earth is waːnd itsɛlf? Turns out it’s meant to be wound itself. Strangely, the last transcript offered was fine (though we might quibble about inconsistent stress marking, not to mention prevocalic tə alongside preconsonantal tu). 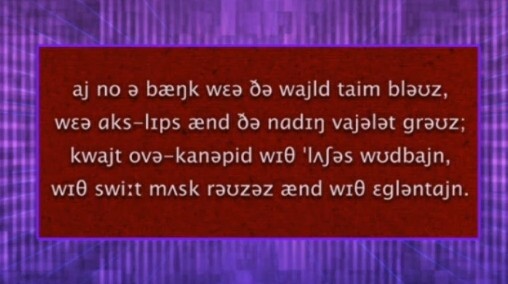 How could it happen that the BBC, in this prestigious programme aimed at a highly literate demographic, could make such a mess of simple phonetic transcription? The second and third screens were worse than average beginners, doing their very first transcription exercise, would come up with. Yet the BBC, in its Pronunciation Unit, employs three highly qualified phoneticians, any one of whom could in ten minutes have supplied accurate transcriptions for the programme. I think that using ignorant amateurs to set questions for a university-level quiz on national television is nothing short of scandalous. It is scandalous - little better than the fake phonetic transcriptions you get on T-shirts at festivals, saying things like Ecstasy /ək'sta:se/. It wasn't on screen for long, and I was concentrating on recognising the quote. Even so, I noticed the vowel symbol in oxlips. Jeremy Paxman kept referring to IPA English or International Phonetic Association English. Nevertheless, the question worked perfectly well as a question. Three were easy because they're well known quotations from well known plays. The King John quotation was difficult because of the play, not the notation. I'm wondering if waːnd for wound might be a case of getting transcriptions from a word list, or from a dictionary or such, and getting the pronunciation of the past tense of waind (wind). Still not accurate, but close. Looking up the transscriptions rather than transcribing might also explain some of the inconsistancies. On me---an 'ignorant amateur' myself---the whole stuff makes the impression, not so much of the work of 'ignorant amateurs' (these usually are quite consistent in their misconceptions, while I can't see any consistency in the errors here) but rather a mixture of such things as absent-mindedness, extreme fatigue of the typist, typos, and such-like. Maybe a machine was at work, or maybe something got mechanically copied from a list (Ellen's suggestion) or something like that? Or maybe someone was just fooling around unaware that the results thereof shall go 'on record'? How 'wound' should wind up as 'waːnd' is absolutely mysterious to me. Ellen's suggestion does not quite convince me. It is at least to be hoped that however did it (if a human being at all) she/he/it/they had a good time cooking their stew. 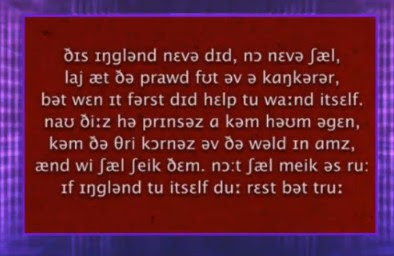 Has anybody played the question on iPlayer and managed to read the texts in real time? OK bɪweə ði aɪdz əv mɑ:tʃ was easy enough in the time who read managed read the whole of the others? If only it were possible to be surprised or shocked by this sort of shoddiness. Yes, it's scandalous, or should be, but it's commonplace in the quizzes and factual programmes of the "prestigious" BBC. If you email to point these things out, they leave you in no doubt how little they care. It's entertainment! Showbiz, darlings! Get a life, innit!